In “What Is Your Mental Model for 21st Century Education?,” William Zaggle asks, “What is your mental model of the way technology ought to fit into the teaching and learning process?” In my model, there are two competing models. In one, the emphasis is on the school. In the other, on the student. I think we can roughly divide most educators into one or the other. In the school-centered model, planning begins with the realities of the school. Technology is retrofitted into the school or the school is enlarged to accommodate technology. The student is then interfaced with the technology. 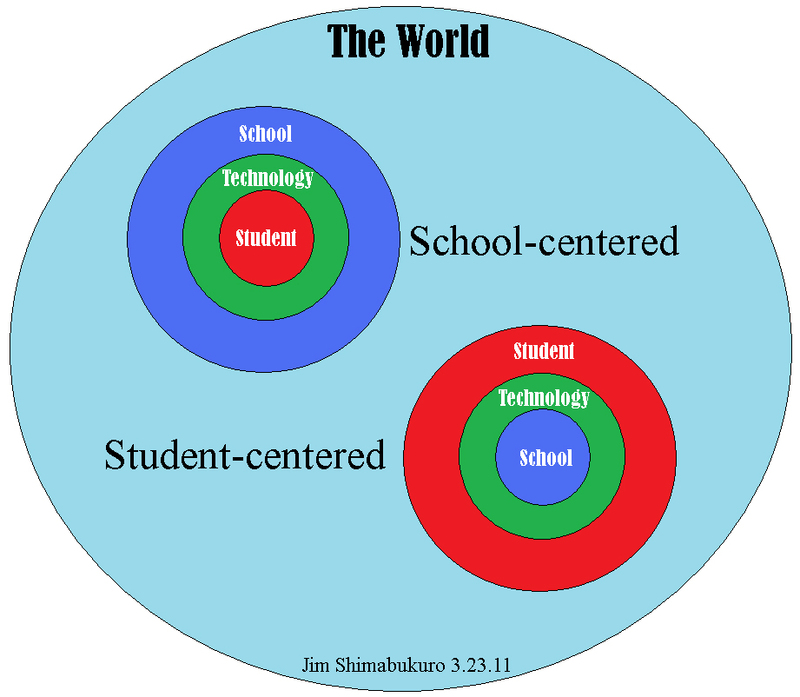 In this model, “student-centered” simply means that students are factored into a school-based equation. In the student-centered model, planning begins with the realities of the student. Technology is a part of his/her life. School is one of many different technologies. When we begin with a school-centered model, the closest we can get to online learning is a blended model, or classroom-based learning with online components. Blended advocates might argue that the online share may be greater than the face-to-face and that, after a certain ratio is reached, a class can be considered “online.” This logic falls apart when we view it within a visual model such as this. That is, blended is actually a subset of online — not the other way around. When we begin with a student-centered model, we realize that blended is really just a school-embedded technology — one of many different technology alternatives. Zaggle’s article reminds us that illustrations often clarify what words can’t seem to express, and that they can serve as tools to see how complex systems actually work, especially when they involve different ideas that interact or compete with one another. So, what is your mental model? Please share them with Zaggle at wzaggle@globalscholar.com. If you’d like to submit an article centered around your drawing, then please email it to me at jamess@hawaii.edu. I don’t know about mine, i.e. I’m incapable – and wary – of visual representations of human interactions. Not only of really human relations: when I was a student at Geneva university, I attended a seminar on Shakespeare’s comedies. The professor was very much into doing diagrams on the blackboard, and one day I got unseemly hysterics when my neighbor whispered to me “This looks like something out of Masters and Johnson”. That’s why, in my previous attempt to reply to Zaggle’s query, I looked for a visual model of the learning-teaching relation according to Freinet. I didn’t find one, so I’ll refer to Andreas Formiconi’s sociograms of the course about internet tools he is presently doing for medicine students at Florence universities, but has also opened to external people. In http://it.wordpress.com/tag/corso-primavera-2011, look for the posts with “sociogramma” in the short description. Red dots are medecine students, dark blue dots cyberstudents, turquoise dot he. Actually, these sociograms are not models, but reflections of our online interactions he represents visually via a tool he made that collects info from RSS feeds pertinent to these interactions. I particularly like Daily: Gradite Contaminazioni (Welcome contaminations), about how at one point some of Andreas’ students and cyberstudents’ participated in the discussion of 2 poems on the blog another cyberstudent uses for her own secondary school students. These sociograms are not as neat and clean as theoretical models, true. But they reflect real interactions that are happening in a real course, and they provoke further discussions between course participants, a common reflection on what it means to learn in a connected, open context, where you cannot know all the dimensions, but choose to create your own pattern of significant relations. I can’t visualize my thoughts about a model clearly enough to draw it, but it seems that the faculty needs to be in there somewhere. Even in the MOOC model there are facilitators or guides (faculty if you will) helping to move things along. I think faculty can be the bridge between student and school through technology. Some students could probably do quite well in developing a PLE for themselves, but a teacher, of sorts, would or could facilitate that process if they were learning technology competent. Jan, good point. I failed to mention that the model is to be used by educators: teachers, administrators, etc. to plan curricula and pedagogy. Teachers would definitely be in the picture to, as you suggest, guide students, facilitate learning, assess performance, etc. In the student-centered model, especially in the early grades, my guess is that F2F and school would play a much larger role. Still, teachers would be well aware of their students’ largely extracurricular PLEs and PLNs and gradually guide them toward using those skills to also facilitate and enhance learning. In other words — to use another analogy — students have a huge, multi-layered buffet in front of them that stretches to the horizon in both directions. The teacher’s task will be to teach students how to get the best from the buffet in terms of health and well-being. Instead of separating students from the technological world they live in outside of school, teachers would welcome the whole child into their classes and teach students how to create PLEs and how to participate in PLNs for learning. My guess is that this process would be a lot more fun and natural for both teachers and students. Of course, there are dangers on the web, and we’ve seen examples in social networking platforms. However, educators will — as they have in the past– work with parents and their communities as well as legislators and national/international organizations to address them. In both of these models, technology is an interface layer between student and school. In your mind does the technology in these models come from one direction or the other or both, or does it just exist. To me, in the school centered model it seems the technology mostly stems from the school with the students somehow attached to it, like in an LMS. If this is reversed in the Student centered model then technology must be coming from the students with an implied obligation of schools to attach to their technology, more like a PLE. Any thoughts? William, your interpretation of the school-centered vs. student-centered tech planning is absolutely correct. Re the relationship of the circles — they’re actually based on set theory. That is, the smaller circle is emedded in the larger circle. In terms of logic, the larger circle would be like the major premise, and the smaller, the minor, and the smallest, the conclusion. But all this doesn’t matter if you received the intended message. I agree that having no model to work from is much like driving around without a map. You end up just going the same old places via the same old routes. Being able to visualize where we are in respect to the world around us keeps us from being afraid of being lost, and more willing to try new pathways. I had hoped that your simple example would illustrate that models do not need to be complex to be functional. Previously unknown or unexplainable reality is often discovered when we can engage the right sides of our brains with more graphics. Maybe the lack of concrete models explains some of the slowness of this industry to make significant change? William, your question — “Maybe the lack of concrete models explains some of the slowness of this industry to make significant change?” — is a good one. If the only model we have is the status quo, then we’re doomed to perpetuate it. It’s like the proverbial carpenter with a single tool, a hammer. S/he’d be forced to approach every task, every problem, as though it were a nail. In this light, the lack of fluency and flexibility in envisioning a wide range of possible models is disastrous. It’s like being isolated in a small corner of the world and being unable to imagine all the possibilities of life. What about a UK (?) dart target, as in this Andy Capp comic (1)? (1) From: Dart season spring 2011 begins “soon” – Eric Materns’ blog. March 10, 2011. See also http://en.wikipedia.org/wiki/Darts for clearer pictures of darts targets. Great points you’ve shared on the student-centered model! From blended learning – to PLE– to PLN—to MOOC. One barrier to adoption to blended learning is safety, which is why we created a collaborative learning site that is safe for students.